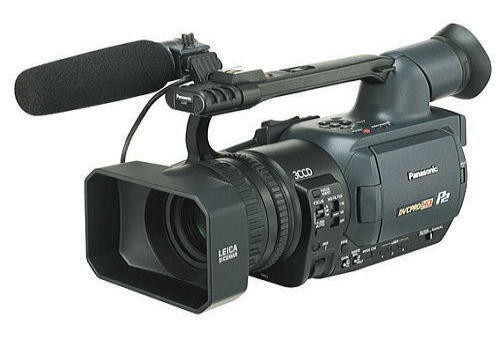 The AG-HVX200E is one of the best hand-held, high-definition PAL cameras ever. A breakthrough design, the HVX200 uniquely combines multiple high- and standard-definition formats, multiple recording modes, variable frame rates, and the vast benefits of solid-state memory with P2. More than HDV this camera will also shoot DVCPRO50 and SD video, only SK is possible with DV tape, HD and DVCPRO require the 8GB to 32GB memory cards and other media options. P2 cards not included. Video output: high definition RGB component via special cable which is supplied with the camera. The Mini 35 adapter from P S Technik allows you to use 35mm film lenses on JVC GY-HD100U, Panasonic HVX200, Panasonic AG-DVX100/DVX100A/DVX100B, Sony HVR-Z1U/HDR-FX1, PD150/PD170, Canon XL1/XL1S/XL2/XL3 (XL H1) to achieve virtually the same depth of field, focus and angle of view as with a 35mm film camera. The amount of footage you can store on a single P2 card will depend on your recording format. For P2 charts see this tech article.